Such a solution, consisted of a standard BusyWin coupled with the customised software developed as per the requirement of the organisation, is termed as BUSY Enterprise Solution. To understand the concept of the same, we will first have to understand the architecture of BusyWin. 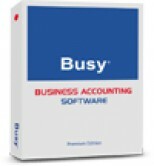 BusyWin (BUSY 3.9) has been designed using three-tier architecture. First tier is the front-end. This tier accepts inputs from the user and gives the desired reports. Second tier is business logic that is invoked by the front-end (first tier) to write or read data from the databases. Third tier is the actual databases where the data is stored. Now, if an organisation wants a customised Report / MIS or Data Entry Module, that is not provided in Standard BusyWin, the same can be developed by any third party software developer using the functions provided in the second tier of BusyWin. To maintain the integrity of databases, direct access to BUSY databases is not allowed.